Seven Ahwazi Arab opposition activists have been sentenced to death in secret trials in Iran's Revolutionary Court in Ahwaz City, according to reports from the IranPress news service and the Human Rights Activists in Iran group. Two others have been sentenced to two and three and a half years imprisonment, respectively. In an appeal to UN Secretary General Ban Ki Moon, world leaders and the NGO community, the Ahwaz Human Rights Organisation (AHRO) identified the men as Ali Saedi (25), Valid Naisi (23), Majid Fardipour (Mahawi) (26), Da'iar Mahawi (50), Maher Mahawi (21), Ahmad Saedi, (28), Yousef Leftehpoor (25), Sayed Morteza Musawi and Adnan Biat. Some of the men are known cultural rights activists. All but Musawi and Biat were sentenced to death. 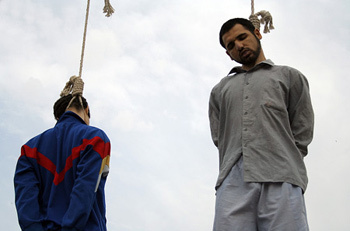 Arrested in August 2007, all men have been held for months in solitary confinement in Ahwaz's notorious Karoon prison, where many Ahwazi Arab political prisoners have been tortured and executed. As is typical of Revolutionary Court proceedings against political activists, they were denied access to a lawyer. Saimari was renowned for his fiery and sometimes violent rhetoric against Sunni Muslims, who he claimed were heretics. He was a known agent of the Iranian intelligence services while serving as the imam of Zahraa mosque in the poor, Arab-populated Hey al-Thawra district of Ahwaz City. No Ahwazi Arab group claimed responsibility for the assassination and no evidence was produced to substantiate the government's charges against the men, who denied all charges of involvement in armed struggle and murder. Past executions based on similar charges have been carried out against innocent political and cultural activists, including some who were already in prison when the crimes they were alleged to have committed were carried out. The execution of Ahwazi Arab activists has been ongoing since the April 2005 Ahwazi Arab intifada against the regime. Thousands of Arabs have been arrested by the regime and scores have been killed, either summarily or executed following secret trials. According to AHRO, since the intifada began on April 15, 2005, over 5,000 Ahwazis have been arrested, at least 131 were killed and over 150 were disappeared, believed to have been tortured and killed by Iranian security forces. The tortured bodies of 'disappeared' Ahwazi Arab activists have been washed up on river shores or caught in fishermen's nets. The regime has linked the unrest to foreign influence, but has declined to provide any evidence to substantiate its allegations despite promising to do so. These unfounded claims include the allegation by a news agency run by supporters of President Mahmoud Ahmadinejad, Raja News, that the British Ahwazi Friendship Society (BAFS) was set up by British intelligence services in collaboration with Wahhabist (Sunni fundamentalist) groups. BAFS has repeatedly stated that it opposes all political violence in Iran committed by both the regime and its opponents and has condemned assassinations and bombings. In reality, the accusations of foreign involvement are a ruse to justify the brutal persecution and arbitrary collective punishment of Ahwazi Arabs. The execution campaign against Ahwazi Arabs has been condemned by independent experts appointed by the United Nations Human Rights Council, the European Presidency, the European Parliament and members of the British Parliament. Although the Ahwazi Arab homeland in Iran's Khuzestan province is one of the most oil-rich regions in the world and represents up to 90 per cent of Iran's oil production, this community endures extreme levels of poverty, unemployment and illiteracy. Ahwazis are subjected to repression, racial discrimination and faced with land confiscation, forced displacement and forced assimilation. Details of Iran's persecution of Ahwazi Arabs are contained in the Ahwazi Human Rights Dossier, compiled by AHRO and BAFS.